The first step in discernment is simple, but difficult - fall in love. Eventually, you will fall in love with the person/diocese/religious order you are being called to...but first you need to fall head over heels in love with God. People get really hung up on wanting to know exactly what God's plan is but the truth is, once you are in love with God, the details don't matter as much. The summer before my senior year of high school, I went on a retreat at my parish, and my faith truly shifted after that retreat. My faith and my love of God had always been at the core of who I was, but suddenly I became an adult in my faith. Much of it was thanks to a friend who I had known before the retreat, but became much closer to because of the retreat. She was the one who got me hooked on the habit of daily Mass and stopping in our small town church to pray during the day. It felt so strange being alone with Jesus at first...and then it felt wonderful. Now I take advantage of slipping in to a church or chapel with a tabernacle whenever I can. I just love being alone with Jesus in the Eucharist, and my love for that began that summer. It was providential, because the following school year was spent discerning colleges, and it was incredibly stressful. I was applying to a college that I assumed was probably way out of my league, and it ended up being the last one that I heard from (and got accepted to!). Yet, throughout all of it, I felt God nudging me in a certain direction, and that helped keep me focused. I felt peace. I knew God would provide. But I wouldn't have known that, or felt that, if it hadn't been for the fact that He had already captured my heart. So, if you are trying to discern your vocation, the best thing you can do is to learn to "waste time" with Jesus. Sneak off to an open church or chapel, or slip into adoration whenever you can. Whenever you can. The more time you spend with Jesus, I can promise you, the deeper you will fall in love with Him. Of course, I am speaking about this as a woman, and I only know what "falling in love with Jesus" means for a woman. I know about the emotional experience of that from a woman's perspective. I'm guessing that men fall in love somewhat differently, but the end result is basically the same - your Beloved fills your mind and heart, and all you want is to be with Him, to follow Him. You become convinced that there is nothing more important in this world. The thing is, that if you allow yourself to fall totally in love with Jesus - He will point you to who you need to fall in love with next. A vocation is, ultimately, God's greatest gift of love to you. In your vocation, you will be able to love most perfectly, and know the deepest joy. I'm not saying, "The second you stop thinking about your vocation, you'll find it!" I'm saying that the second you give your vocation to God, you can stop worrying about it. Of course you'll still think about it - but you can have some degree of peace in your life. I know and have known a number of people who have desperately wanted to know what their vocation is, or to find their spouse (and I've been there myself). But I'm telling you - you have to go to Jesus first! And if you do, He will do the heavy lifting. He will give you the grace to fall in love with Him, and with whoever else you are destined to devote your life to. But first, your heart needs to belong to Him. If it doesn't, it will be so much harder to love your spouse/diocese/parish/religious order in the right way. You will put too much into other people, and they will break your heart. That longing you feel? Only Jesus can satisfy it. If and when you are unable to actually, physically be with Jesus in the Eucharist - make a spiritual commuion. Pray the rosary, the Liturgy of the Hours, the Angelus, and silent mental prayer. Everyone has their own flavor of prayer (my husband loves the rosary, but I'm a Liturgy of the Hours girl all the way), so find yours and let God be a part of the rhythm of your day. Incidentally, this kind of habit is good to form in preparation for your vocation. I know that priests and religious are obligated to pray the Liturgy of the Hours, for example. But also, you need to get in the habit of disciplining yourself to spend time with someone you love, even when it doesn't come easily. 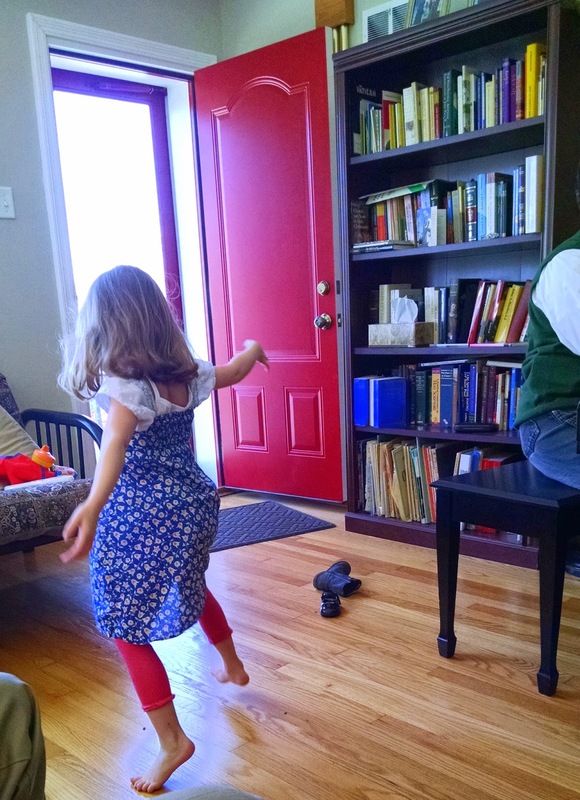 I love Andrew and the girls with all my heart - but sometimes it would be much easier to withdraw from family time and immerse myself in my phone, or to refuse to do an activity that would make them happy because I don't "feel like it." This is even a danger in marriage! I still am very much in love with Andrew, but it is a discipline to set aside time to talk to him and pray with him and spend time together on the days when I am feeling lazy. Relationships of love take work! They aren't easy. Love is a choice. Choosing to love God through the discipline of prayer is good practice for choosing to love each day, in your vocation. So just fall in love with Jesus, mmmkay? 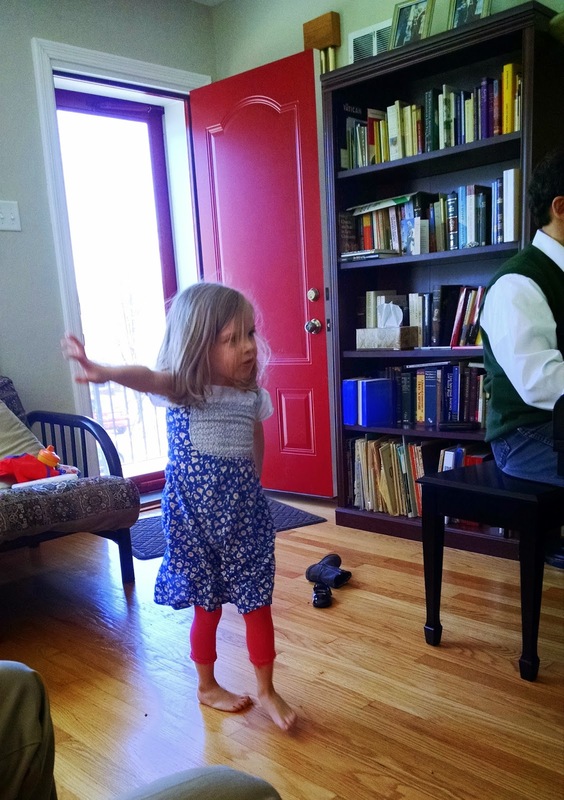 We went to a friend's house for lunch, and our friend played piano and baby girl was dancing up a storm!! Linking up to Fine Linen and Purple.